Have you come across the error as shown in below image? You get the above shown error in Visual Studio while pulling changes from the git server. 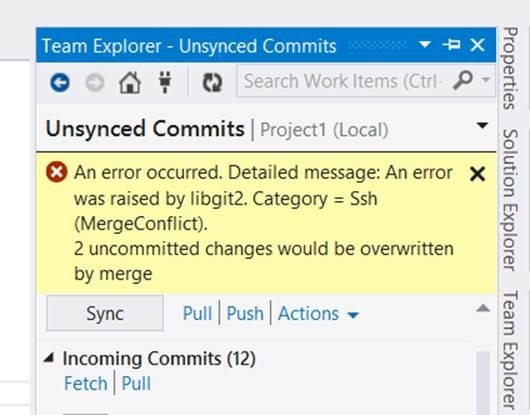 This error causes because you have local changes without the commit. In this scenario the visual Studio does not give very readable error message. Perhaps you may want to use git command for pull for more information on the error. The git pull command clearly says that either commit the changes or stash them. If you are not sure about the local changes then better option is to stash them. Local changes can be stashed using the git stash command. After stashing the local changes (you can commit also) run the git pull command to pull the remote changes from the git server. You should not get any error doing pulling the latest changes. Hope it helps. Happy coding.